Being Fulfilled assists the entrepreneur thru complete honesty around what they can and can’t accomplish in a given time frame. It gives them a proven model to help them structure their business day to focus their energy on result producing activities to create a profitable business. The challenge with most business savvy people is that they tend to neglect the other important areas of their life. This book solves that challenge! Most of us live our lives wanting to feel “more fulfilled.” We know what that means and how that might feel, but the method of how we achieve that sense is absent. 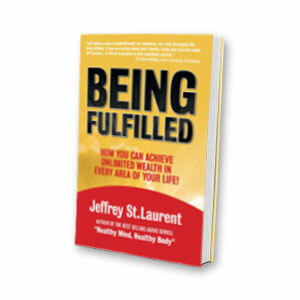 In Being Fulfilled, Jeffrey St. Laurent presents a model which challenges the conventional way of thinking and assists us with filling in the gap between wanting more and actually enjoying more. He specifically applies this proven model in the three most significant areas of life: business, relationships, and health. Jeffrey helps us narrow our vision and then focus, nurture, and train in ONE area. He questions the idea that there IS a magical point on which to stand where business, relationships, and health are in perfect harmony. “Over the years, authors have sent me quite a number of books to review, and it has been hard, if not impossible, to write much about another book that covers the same old tired topics. Jeffrey’s book, however, caught me off guard. It represents a fresh, clean look at personal fulfillment. Seen through his eyes as a personal coach and fitness professional of the highest caliber, he talks about building a life worth striving for, using easy exercises and relevant examples that everyone will be able to relate to.